The next version (2.1) of Xataface includes a new simple, but powerful, feature that can drastically improve performance on tables that include grafted fields - especially when those grafted fields include expensive calculations. The feature is called "dynamic tables". A dynamic table is a MySQL table that is generated with the results of a query. It is dependent on the tables included in the query, so that if any of them are modified, the dynamic table will be deleted and rebuilt. They are very similar to MySQL views, except that they can perform much better in environments where updates are rare relative to reads. Let's motivate dynamic tables by way of an example. Consider a database with a table of contacts, called "current_call_list". There is also a "calls" table to record all phone calls made to each contact. The current_call_list itself only contains data pertaining to the contact (e.g. name, phone, email, etc...), but we would like the list view to also include some calculated information such as how many calls have been made to the contact, when the last call was made, what some recent call comments were, and what some of their responses were to questions asked during the calls. This works. But it has brought with it some hefty performance baggage that we feel in a big way as the database grows beyond a few thousand records. The problem is that all of the calculated fields require subqueries and aggregate calculations to be performed on the calls table. Notice that our SQL query has become much more efficient. Rather than performing aggregate calculations on the calls table, it does a simple left join on our new view. Generally joins on key fields in MySQL are *very* fast. In this case, we're cheating a bit by using a view, so we will likely lose a little performance there. Playing around with the database a little bit more, shows that the performance is marginally better, but still sluggish on larger databases. It appears that the view still has to perform some intense calculations each time. In our application, the calls table is updated relatively infrequently compared to the number of read requests. We should be able to take advantage of this fact to cache our calculations whenever the calls table is changed. This is precisely what a Dynamic table is for. The Dynamic table generates itself as necessary with the results of an SQL query. In each HTTP request, it checks the modification of all dependent tables to see if they have changed since it was last generated. If they have changed, then the dynamic table is cleared out and repopulated. An array of SQL statements that should be executed to create the table and populate it. The first statement is usually a CREATE TABLE statement. Subsequent statements are the queries that populate the table. An array of table names that this table depends on. If any of these tables are changed, the dynamic table should be deleted and regenerated. The update() method is where the actual work is performed. The best place to for this code is somewhere that will be executed in every request, and before the query is sent to the database. Xataface 2.1 has supports the beforeLoadResultSet() exactly for this purpose. It is executed just before the result set is loaded, so it gives us a chance to generate the table before it is used. Since we have named this table the same as the View in our last example (note: we need to drop the view before doing this), we don't need to make any changes to the __sql__ directive in our fields.ini file. Since the SQL query that Xataface has to perform is just a simple join between two *real* tables, the application is much more responsive. Actually an order of magnitude faster. Creating Your First Application (from the Getting Started tutorial) - Shows use of the "makesite" script as well as manual installation steps. How to build a PHP/MySQL Application with 4 Lines of Code (Shows the "manual" approach). About Xataface > Your First App - Also shows the "manual" approach. Build a Blog in 4 Minutes (Video) - Shows use of Web-based install tool. Introduction to Xataface (Video) - Also shows use of Web-based install tool. Using the makesite shell script. Using the web-based install tool. It is really easy. 2 lines of PHP, 5 or 6 lines in the conf.ini file, and copy the .htaccess file. and you're done. It helps you to understand the application structure from the beginning. You're going to have to start customizing your app by hand sooner or later, so why now make it sooner. If the web-based installer can't connect to the database, it is likely that your database is located on a different domain than localhost. The Xataface installer script has the database host hard-coded into the script as "localhost". If your database is located on a different server, as it may be on some shared hosting environments, you may need to modify the "installer.php" file and change the DB_HOST constant to the correct value for your server. The web installer uses the password that you provide to connect to the database. It must be a valid mysql username and password that will have access to at least the database on which you want to create your app. You may also enter your MySQL root password here - as it will only be used to create the app - you will have another opportunity to specify the user account that the app will use for connecting to the database. If it keeps prompting you for the password that means that you are entering incorrect credentials. If you're sure that you're entering the correct information here, I wouldn't spend too much time trying to solve it here. Just skip straight to a manual installation. Likely you are following the Getting Started Tutorial, and you have just reached the end of the "Xataface Installation" section. Installing Xataface is actually easy, it just involves copying it to your web server. However, xataface being installed is different than your app being installed. You still need to proceed to the next section of the getting started tutorial on creating your first app. Better yet, just follow the manual installation instructions so you don't have to futz with any app creation scripts. The single most common "help" request I get on the forum is the blank white screen issue. If you get a blank white screen when you try to access your app, it means that there is an error that caused PHP execution to fail. Likely it is an issue with a require statement pointing to the wrong path, but, technically it could be *anything*. You need to check your PHP error log to see what the actual error is. This is a good opportunity to get acquainted with your PHP error log because it will be your best friend going forward. If you post to the forum without knowing where your error log is or where errors are being written, you'll likely just be sent on a mission to find it. Some tips on solving the "blank white screen issue". No Such File or Directory "xataface"
This should point to your xataface/public-api.php file. Make sure that it points to the correct place, and that the permissions on the file allow reading from the web server process. If your application loads but it looks weird (e.g. missing images, no style, broken page formatting, etc...), it means that the 2nd parameter of your df_init() function (inside your index.php file) is pointing to the wrong place. The 2nd parameter (in this case 'xataface') should be the web-accessible URL to the xataface directory. It may be an absolute URL (e.g. http://example.com/path/to/xataface), or a relative URL (e.g. 'xataface'). This parameter is used as a base for loading all images and CSS stylesheets in the Xataface directory. If it is wrong, you'll get no style. 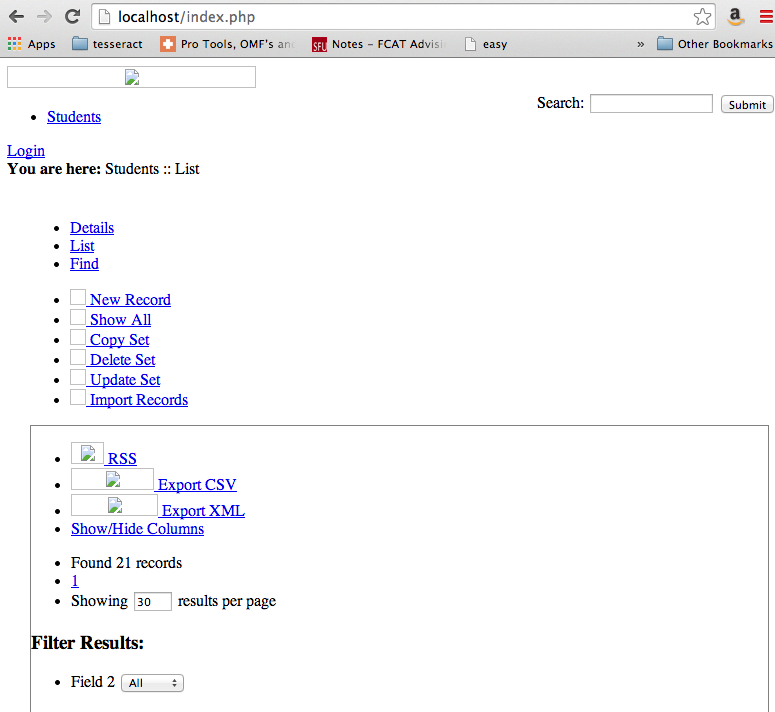 After you fix this, you should see the page formatting correctly.